Citizens Uprooting Racism in Bermuda [CURB] provided an update on the Truth & Reconciliation Community Conversations initiative that was announced last month, saying that over 100 people will be participating in the sessions. “Within 48 hours of the January 11th launch the three groups being held island-wide were full, and we are delighted we have a diverse population participating,” CURB said. “In order to meet the need we created a fourth session so that those willing to participate could do so. Currently we have a waiting list and are in the process of finalizing the groups. Over 100 people will be participating in these sessions island-wide, with the first session beginning on 14th February 2016. “As the Community Conversations have been designed to go through a process, we have sought confirmation from each participant that they can commit to be present for all 6 sessions. These sessions are 2 hours long and will be held twice a month for three months. We are happy that so many are willing to make this substantive commitment. “Locations for the meetings are Emmanuel Methodist Church [West], Crawl Gospel Hall [East], Human Rights Commission [Central #1] and Bermuda College [Central #2], and we are sincerely grateful for the use of these facilities to hold these important community conversations, and wish to extend our sincere thanks to those who have provided access and support. “We are especially grateful to the 12 facilitators/mediators from the community who have volunteered their time to run the sessions over the next six months. This is truly a community-involved project. 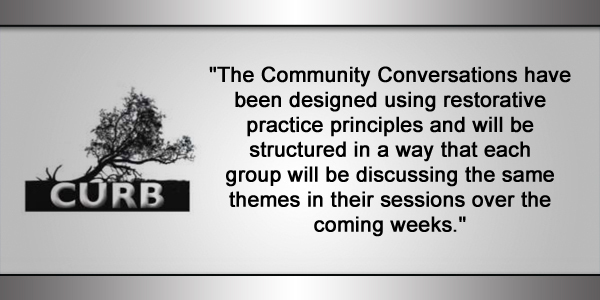 “The Community Conversations have been designed using restorative practice principles and will be structured in a way that each group will be discussing the same themes in their sessions over the coming weeks. “The importance of data collection, evaluations, and reports have been included in the process to ensure that feedback is captured and solutions and ideas for transforming and healing our community are put forward to the wider community. CURB said, “Participants will be encouraged to understand they are beginning a long and complex journey, but one of deep societal transformation that promises rich personal and community rewards. “These rewards may include economic growth, political stability, tranquility, pride and a sense of common humanity as the community approaches its destination – the elimination of the myth of a hierarchy of human value. “Each community is different and must recognize its uniqueness, both its unique assets and challenges, as it begins its journey. Those who participate will be at the forefront of helping people to recognize one another’s humanity and value. “The truth and reconciliation process seeks to improve our capacity as communities and as a country to see ourselves in each other, so that we can shape a more equitable future with opportunities for every child to thrive. “Ultimately, the process will reveal untold truths related to the racial hierarchy belief system and heritage of Bermuda; fostering healing and producing actionable recommendations for change. Our collective efforts will provide access to truth and healing that will underscore the value of authentic, complete and accessible history and culture of diverse groups. Because you want to see progress made? Because your want of a racially harmonious island outweighs your hate of Lynne Winfield? Because claiming to want these things whilst using the slightest excuse not to participate shows your true colours, and that must hurt? Because the discomfort you’ll feel participating in this whilst knowing Lynne Winfield has put this on pales in comparison to the discomfort blacks have had to endure for the past 400 years, simply by being black? Because no effort in this regard is a bad thing? I could go on and on. Why don’t you tell us why your dislike of Lynne Winfield is bigger and more important than trying to better understand the root cause of so many of the issues we face today? Or do you now see that it is this exact mindset – that you are somehow bigger than the problem and not the problem itself – that has caused us to get to the place we are today? Why you no like her? Any old excuse will do……. felt the same way but decided instead of grumbling to join and see for myself and become part of the solution instead of the problem. so I will see first hand if they believe in seeing all sides or are just looking to push their own agenda. Virtue signalling at its finest!!! Truth and Reconciliation in South Africa was an exercise where those who committed crimes toward the oppressed just admitted their atrocities without ANY RECOMPENSE while the victims had no JUSTICE. When are you going to admit your crimes against humanity, OJ? Tell us what you have in mind for Bermuda O.J. Perhaps OJ. However what many of conveniently hide is the fact that slavery still exists in Africa and is rampant in many countries. This makes us (and you Onion Juice) uncomfortable because it would mean we have to admit that slavery was not just a crime committed by the white man. It is convenient for many of us to pretend it isn’t happening (for our own selfish reasons) because it would mean admitting that it happened in Africa before, during and still after the slave trade in the Western World ended. The side affect is that many more suffer, because we look the other way. I think we yet again see the bias of the HRC – allowing their premises to be used by a private group which good, bad or indifferent clearly has an agenda. Would they allow an anti-gay marriage activist group the same space for a similar discussion format, say one organised by Mr. Wayne Furbert MP who has not hidden his views on that particular subject? I think there is much truth and reconciliation to be had on that subject too but somehow think the HRC would not allow it to be talked about on their premises. Until they do consider all points of view and not just the radical chic, politically correct flavour of the moment ones, they will continue to lose what little credibility they have. In the meantime, these one hundred folks, don’t they have jobs? how is this version of the Big Conversation going to improve my life? I grew up here, black, single parent family, saw and heard both good, and badness, decided to move in a different direction than a lot of my peers, learned from my mistakes and stupidity, now hold my own in a very difficult trade that is unforgiving toward slackness…..I don’t make excuses, nor do I look to blame or deflect. Am I just an anomaly? and proof of what hard work, perserverance and what keeping your shoulder to a strong wind can achieve. Well done to you–I hope you are successful in your life (and I bet you are) because you deserve it. The only place that success comes before work is in the dictionary, sadly many it seems haven’t been taught this lesson. You are not an anomaly – but you a fighting a necessarily harder battle than your white comrades are you not? Be truthful with yourself. If you look at this from an individual perspective you will miss the forest for the trees. Doing nothing will not improve your life. Doing something, however small it may be, will only serve to try and move us forward together. We need to think collectively and not selfishly if we are to ever see progress made with race relations here/abroad. You dont get prizes for being a turncoat. What do you get prizes for, being ignorant? We have many examples surrounding us that life is about choices. Work harder than your peers and you will succeed where others that make excuses or quit will fail. A few that didn’t have much but worked hard, and have done very well would be Br. Brown, Sir John Swan, Mr. Butterfield, Dame Lois Browne Evans, Nhaki Wells and there are hundreds more. The problem is that we give more attention in our personal lives, and in the media to those that do wrong, then we give to those that do right. Thankfully Bernews, RG and others are starting to see the merit of acknowledging those that do good in the community. If we continue as a people to set the bar low, our youth have no reason to try hard and stand out. The negativity and doom and gloom that many politicians and so called community “leaders” continue to spew is will have the same long term effects as feeding our kids eat lead paint chips. When was the last time any of our leaders preached to our people about the importance of being honest, hard working, on time, reliable? Anyway, gotta go work…but ya’ll get the picture. No, your just that crab that made it out and never looked back to help the rest. We have enough of you as it is, no need to gloat. @swing voter, God bless you, you are certainly not an anomaly, it is you and people that think like you that will save this island. May your way get easier for you as time goes on. Trump and his supporters are derided as racists and bigots for feeling the same way about US immigration. But for some reason CURB is lauded for their stance regarding local immigration which mirrors the US Republicans. Very strange indeed. These goals and rewards sound very much like the goals and rewards from the 70s and 80s. We’ve had at least two generations of kids go through school since then and I know there’s no hierarchy of human value in their lives.